There are about more than 1,500 different species of yeast that can reach up to 3 to 7 and even 40 micrometers in size. Yeast is a big part of our world, it can be found in many of our foods like alcohol beverages, breads, fruits, other food products. It can also be found in soils, plants, and insects. Yeast can survive with or without oxygen and can continue to spread if it fits the environment. Yeast is also a good nutritional supplement with many rich vitamins and proteins. Yeasts is part of the kingdom fungi, which also contains mushrooms, mildews, and molds. There are about 1,500 species of yeast, that can measure up to 3 to 7 micrometers and some can reach up to 40. You can find Yeasts mostly in sugar- rich places, like flower nectars and fruit surfaces. Yeasts has the ability to ferment sugar making them a big part of the human world, such as baking bread and making alcohol beverages, this is from the yeast species called Saccharomyces cerevisiae. Yeast are unicellular organisms with most species divided into two phyla called Ascomycota and Basidiomycota, and over 100 genera. 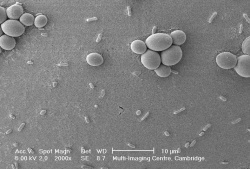 Yeast can become a string formation connected by the budding cells called pseudohyphae, or seen in most molds called true hyphae. They reproduce asexually by budding and rely on the surroundings to survive. They are an important part of our ecosystem as decomposers. Mostly Yeasts are found in fructose sugar fruits like grapes, apples, and peaches, it it also found in some plants like cacti, or plant saps. 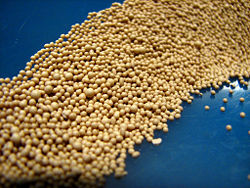 Yeast is also fed to animals in the form of mash or other byproduct forms. There are about 50,000 species of fungi, but only 60 different kinds of yeast relating to 500 different species of yeast. Yeast is all over the environment it can also be found in silages, hays, grain by-products, sometimes found in soil and water. (Saccharomyces boulardii) (large cells) found along with bacteria in fermented fruit juice. Yeast Multiple Authors. Multiple Publishers. What are yeasts? Multiple Authors. Carolina Biological Supply./Phototake NYC. Yeast Products in the Feed Industry: A Practical Guide for Feed Professionals Multiple Author. Multiple Publisher.